It has been a very exciting week in Reception! 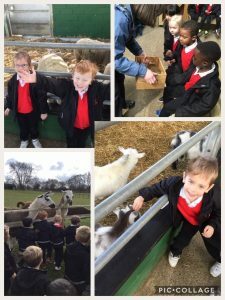 The children had been eagerly waiting for their farm trip to Bocketts Farm, and it did not disappoint. We had beautiful weather and enjoyed a very bumpy tractor ride around the farm. We got to feed some of the animals and the teachers were very pleased with how many children were brave enough to hold their hands out for the animals to take the food. The pig race after a very yummy lunch caused great excitement and Copthorne actually picked the winning piggy. We continue our journey to learn about time this week. We revisited the days of the week and o’clock and now have also been introduced to digital time focussing on o’clock again. The Beebots are still causing a stir in Reception too and the children enjoy programming them to move from one place to another, sometimes getting it right but enjoying the challenge nevertheless. Please remember that we have our Pirate Book Day next Wednesday.